Rawkblog and TwentyFourBit's Waynestock party: Today! Rawkblog and TwentyFourBit’s Waynestock party: Today! Oh, yes. 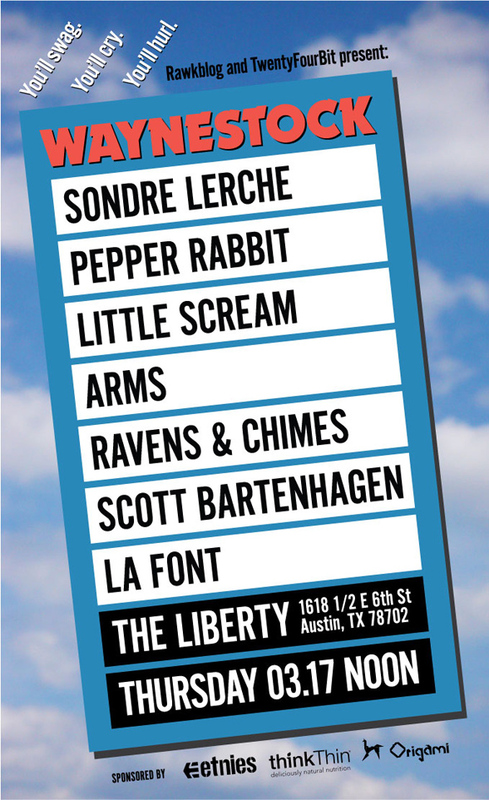 Sondre Lerche at 6 p.m., ARMS at 5 p.m. and so on. Get to the Liberty at noon and we’ll have free beer, free snack bars from our sponsor thinkThin, free shirts from our sponsor Etnies, and free good vibes from our final sponsor, Origami Vinyl. See ya there, and be sure to use #Waynestock on the Twitters.